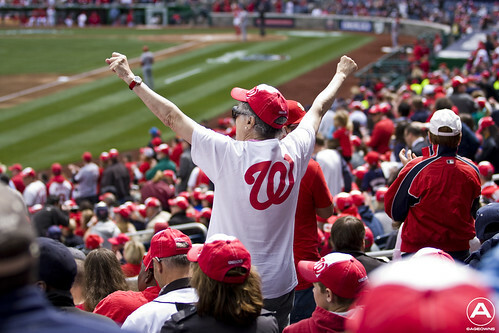 The Washington Nationals rang in their ninth year of DC baseball on Monday afternoon in front of a record-setting regular-season crowd of 45,274. They went on to defeat the Miami Marlins 2-0. The day’s events celebrated both their historic 2012 run and the start of a highly anticipation 2013 season. 2012 was the most successful year in Nats history by far. The Nats touted the best record in all of baseball with 98 wins and 64 losses, four players made it to the All-Star game, several players earned Silver Slugger and Golden Glove awards, Manager Davey Johnson was named Manager of the Year, Bryce Harper won the National League Rookie of the Year Award as a 19-year-old, Executive Vice Present of Baseball Operations and General Manager Mike Rizzo was named Executive of the Year by the Boston Chapter of the BBWAA, and they won their first National League East Division Title. Despite the inevitable growing pains endured during their first few years and the dismal losing records posted in the 2009 and 2010 seasons, the Nats are headed in the right direction thanks to Rizzo building this team from the bottom up. Speaking of building from the bottom up, Stephen Strasburg and Bryce Harper are prime examples of Rizzo’s work first-hand. 100-plus loss seasons in 2009 and 2010 gave Washington the draft position to select the two centerpieces of their 2013 roster. Opening Day put the Nats’ young faces in the spotlight, leading their team to victory. It was Strasburg’s first Opening Day at home since being acquired in 2009 (he pitched in Chicago at Wrigley Field in 2012) and Harper’s first Opening Day as a Major League player since being acquired in 2010, but you never would’ve guessed that from their respective performances. Strasburg pitched a seven inning shutout, retired nineteen consecutive batters and, scattered three hits. Harper hit two homeruns in his first two at-bats. In years past, the crowd at Nationals Park on Opening Day wasn’t always as Pro-Nats as they were on Monday. More recently, the division rivalry between the Philadelphia Phillies and Washington reached a boiling point (e.g. Opening Day 2010) when Nats fans were outnumbered by an overwhelming percentage of Phillies fans. Now that there’s a young, winning team on the field, Washington has what it needs to ignite their fanbase and fill the seats with hometown fans. 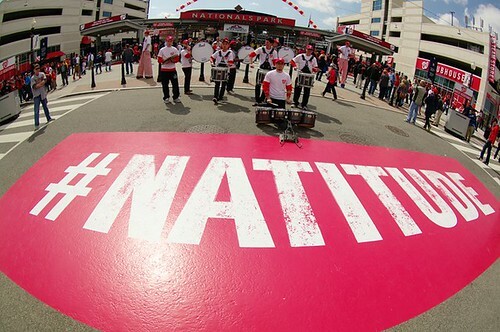 Monday showed that, as it was the most well-attended regular season game in Nationals Park history. The man has an exceptional track record both as a player and a manager in Major League Baseball. What sets him apart from other managers in the game today isn’t simply his experience but how he executes his decisions as a manager. He works in the moment, one game at a time, and has complete confidence in his roster. When reflecting on the Nats’ season-ending loss in Game 5 of the National League Division Series prior to Monday’s game, Johnson shared his thoughts on what 2012 taught his players. “There’s no way you can teach experience. You gotta be there. You have to get there. You have to experience that. That’s the way you grow. And you learn from every situation you’re in. You learn as a manager, you learn as a player, and I knew we’d learn from it even if it’s not something I keep thinking about,” he said.